Up to 10,000e or multirange 2 x 3000e @ 0,3 µV/d in approved version CE-M. Weight application reading from RS232 serial port. Internal digital outputs with configurable functions, on terminal board (photomosfet 150mA 48Vac / 150mA 60Vdc (NO)). Internal digital inputs with configurable functions, on terminal board (isolated photocouplers 12-24Vdc, 5-20mA). 16 bit analogue output, configurable 4-20mA, 0-5Vdc or 0-10Vdc. 4-channel converter to manage up to 4 independent analogue scales. 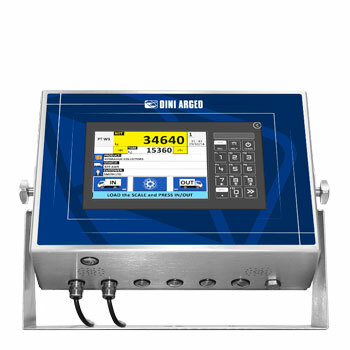 Industrial PC with AISI304 STAINLESS steel body and IP67 protection degree, specific for harsh industrial environments. 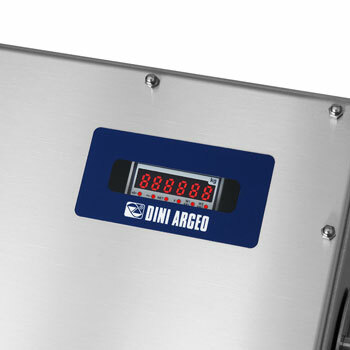 High performance Intel processor and integrated weighing electronics Dini Argeo. Intel Celeron N3350 DualCore 64bit processor, 2Mb L2 cache, up to 2.4GHz. Intel HD Graphics 500 graphics processor. 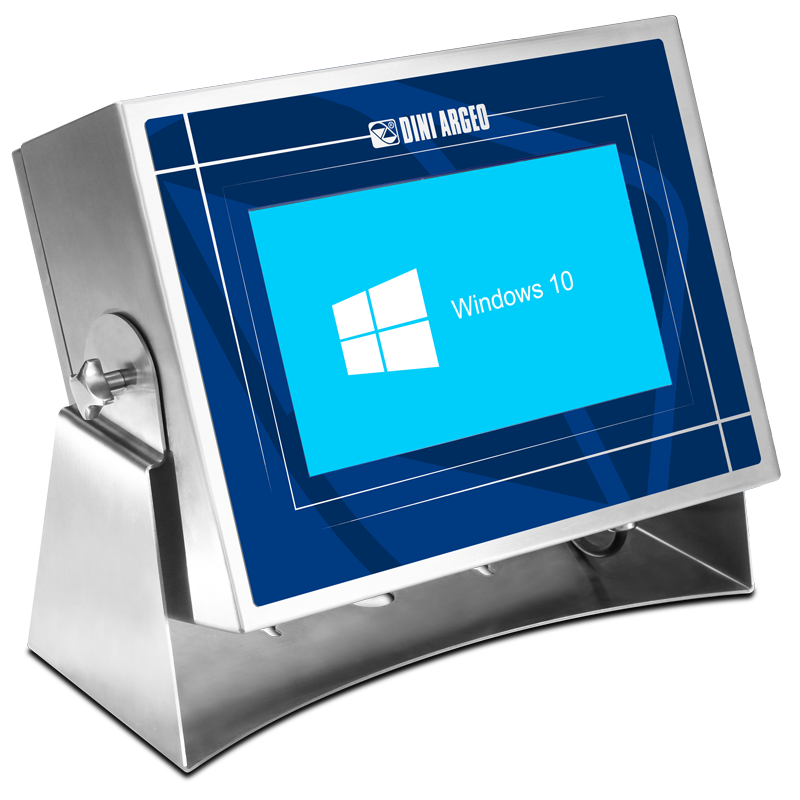 Pre-installed Windows 10 or Dini Argeo AFxxPC operating system. 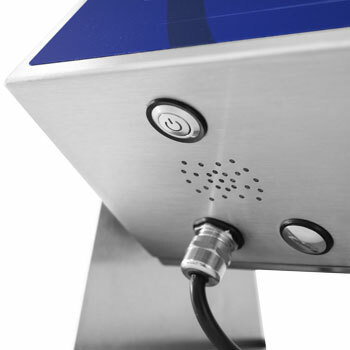 Resistive touch screen display, suitable for use with gloves and in the presence of water/condensation. Dimension 10.1", resolution 1280x800px, suitable for outside view (750 lumen). Data storage SSD M.2 64GB. Integrated double 3W stereo speakers. Integrated RTC (for date/time, bios, etc.). Fanless technology, without cooling fans. AISI304 STAINLESS steel case with adjustable inclination. Standard ergonomic bracket, for bench use or wall mounting. 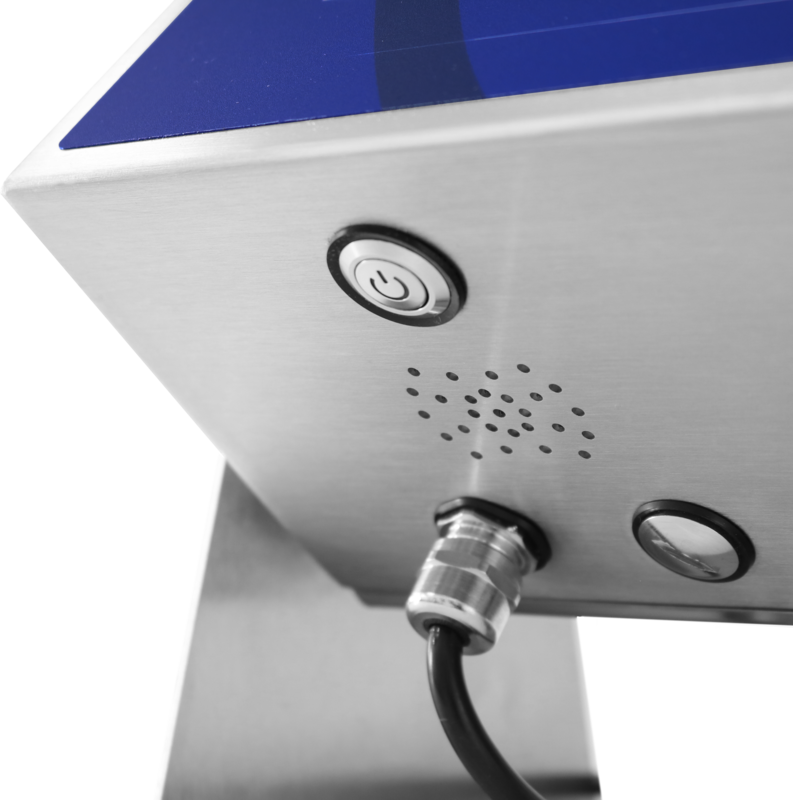 Industrial communication ports with IP67 protection. IP67 STAINLESS steel valve to adjust humidity and pressure inside the case. Working temperature: 0/60°C, 0/40°C for in legal-for-trade applications. 2 USB 2.0 panel ports. 1 USB 3.0 internal port. 1 ETHERNET panel port, 10/100/1000 Mbps. 1 ETHERNET internal port, 10/100/1000 Mbps. 1 SATA III internal port (including cables). 1 analogue input for scale. Integrated Alibi Memory, to carry out approved systems for legal-for-trade use. - Up to 10,000 storages, according to the database. - 2 list of storages exportable on flash drive or network folders. Reading, writing and sharing of archives on SQL databases. 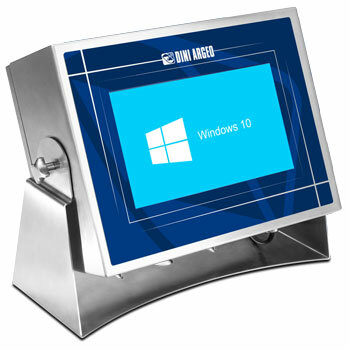 6116PRO High performance Touch screen PC, IP67 STAINLESS steel construction Integrated Load Cell input for scale management and Windows 10 operating system. 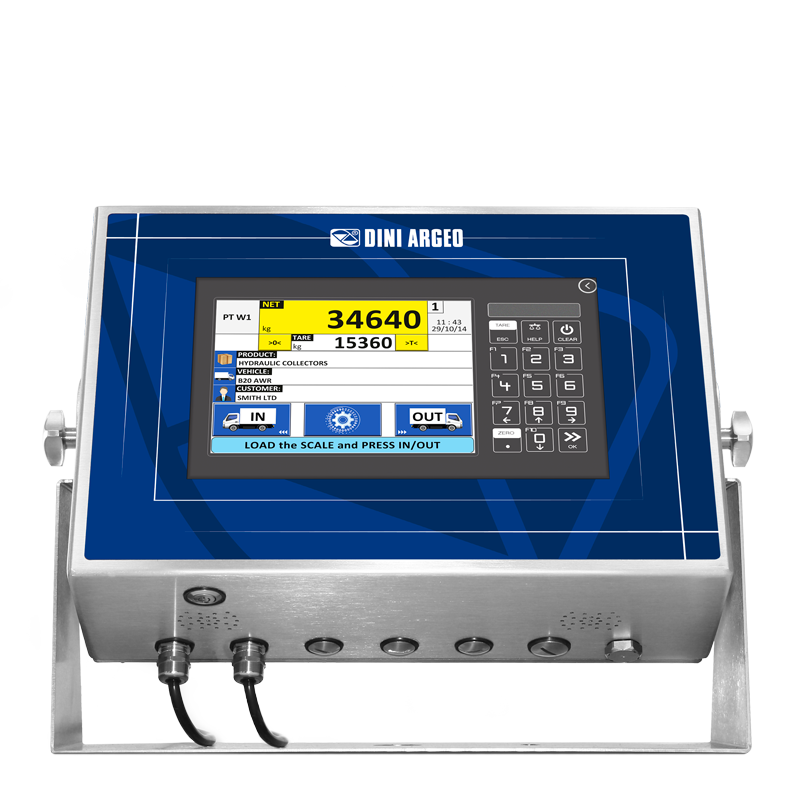 6116PROAF High performance Touch screen PC, IP67 STAINLESS steel construction integrated Load Cell input for scale management and "AF" weighing softwares. PWCORDUK Power supply cord with BS1363 plug (UK plug). PWCORDCH Power supply cord with SEV1011 plug (CH plug). ETHCIP67 IP67 male adapter with cable gland for panel Ethernet port. Cable and RJ45 connector not included. LCCBC (S1) Cable for connection between platform and indicator, l=50cm. Female connector to be soldered. LCCB5C (S1) LCCBC cable + 5m extension cable. LCCB10C (S1) LCCBC cable + 10m extension cable. DGT100R-1 Weight repeater with 100mm LED display. IP68 stainless steel case, 5-key keypad, air valve for regulating the humidity and the pressure. PG9M 10 PG9 metallic cable gland set for weight indicators.